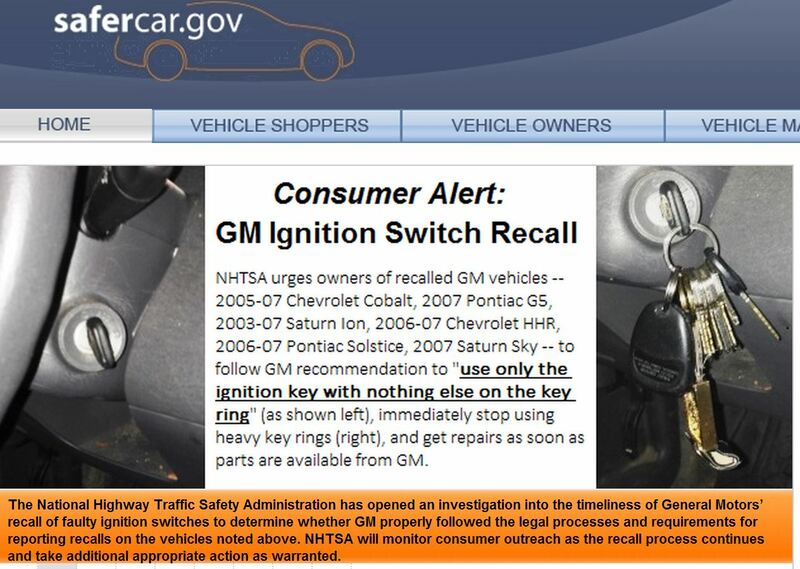 If you’re reading this, you obviously know about the GM ignition recall. What started as a controversy over cars GM “no longer makes” has quickly turned into a crisis of confidence for the automaker. Just starting to shake the mantle of “Government Motors” GM faces accusations of long-term cover-up. Including from none other than the US politicians who had just months ago heralded the company as the ultimate turnaround story. GM is sticking to crises communications standard protocol with measured and factual statements – likely at advice of counsel. Plaintiffs and politicians meanwhile are taking the headlines with inflated numbers and tort based emotional accusations. So far, score one for the plaintiff lawyers. Carmakers get hundreds of defect reports every year, and while GM may have had complaints in 2001, it wasn’t until 2004 that they had credible reports and were able to replicate the problem. In the end, it’s moot. 2004 is also a long time ago, no need to push facts to extend how long they knew. TO me the real question is what happened between the service bulletin issues on OCtober 2006 and the one issues Feb 7 2011. This seems to be the black hole of accountability. Not surprising since the CObalt was discontinued in 2010. Could it be out of sight, out of mind? So far 13 fatalities appear to be from ignition default. The 303 number is the total fatalities in affected cars where the airbag didn’t deploy for any reason. The number is pretty meaningless. The fact any media are using it shows how much traction lawyers are getting. Yes Mary is just getting the CEO seat warm, but she is no newcomer to the situation. She’s a GM “lifer” we were told when she ascended. Her last job since Feb. 1, 2011, was senior vice president of global product development overseeing design, engineering, program management and quality. Yep, quality. The paper-trail leads well into 2011. So I’d be much more cautious in absolving her as a newcomer, and wondering what the quality team was doing in 2011 -13. She once said simplicity was the key to quality. True, but does that only apply to new vehicles. WHen she told her team, “no more crappy cars,” which cars were crappy? I’ve read the conspiracy articles that Mary Barra was promoted to take the fall for this. Rubbish! This gives too much credit to GM for realizing this was going to blow up and frankly is a bit insulting to her accomplishments. Toyota recalled about 7 million cars in the US. But most had a quick fix. Back in 2009 and 2010, the market was moribund. 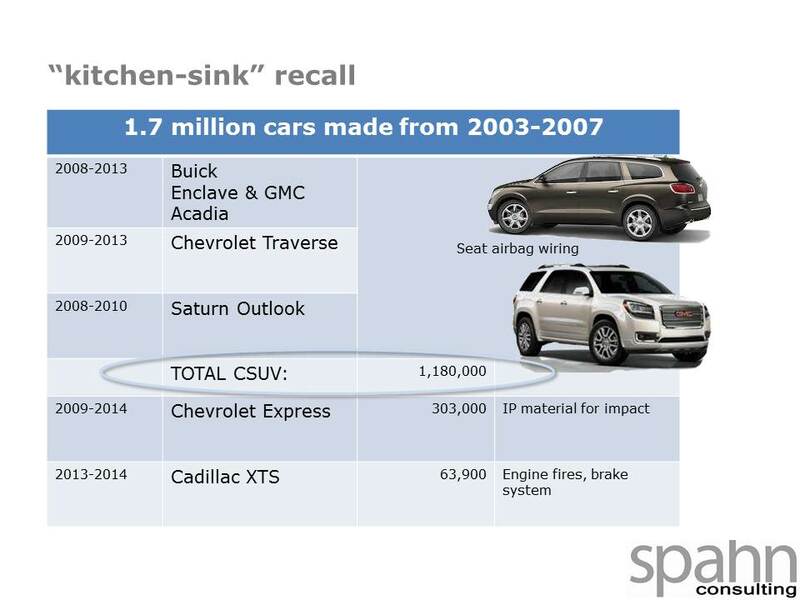 GM threw in 1.7 million SUV’s and trucks for unrelated issues to make their recall a total of more than 3 million. This may be an issue on the loss of sales impact, but on service and other commercial remediation, and especially regarding litigation risk, this is not very relevent. If anything, the DOJ $1.2 billion settlement with Toyota set a bar pretty high for GM’s potential criminal penalty. NHTSA engineering studies and investigations are intensive. They work closely with the OEM engineers, supplier engineers and their own stable of experts. In this case, there are a series of documented meetings where the issue was discussed. News reports themselves show that while GM was sharing what they had (or thought they had) with NHTSA. I think it is more likely that GM hid data from itself. You have to ask yourself whether the meeting of the monolithic bureaucracies at both GM and the US Federal Agency created a logjam of action. At this time, here is still one player who has done a great job of flying under the radar, until today, Delphi. During a recall typically the supply will have a claw back provision to help offset the cost of failed parts. This recall is much more convoluted and explosive. There are accusations that Delphi changed the specs on the part post start-of-production. Combined with GM’s failure to change the part number, this creates chaos in figuring out what went wrong when and by whom. Expect Delphi to fly under the bus in the coming days. Service capability: my bet is no one has a million ignition units sitting in their shop. Sourcing and distributing at this volume will be a strain on P&A group, and will take away from the capacity for this highly lucrative business. At the same time, let’s not forget the 1.7 additional trucks and SUV’s added to the recall for unrelated airbag issues. Loaner cars: GM is already scrambling to get units from rental car companies to allow dealers to provide service. If NHTSA orders a park your car order, they will not be enough loaners to cover the gap in parts supply and service capacity. Litigation from economic loss: This will only throw fuel on the growing call for a class action suit for ALL GM owners to claim loss of value on their vehicles. 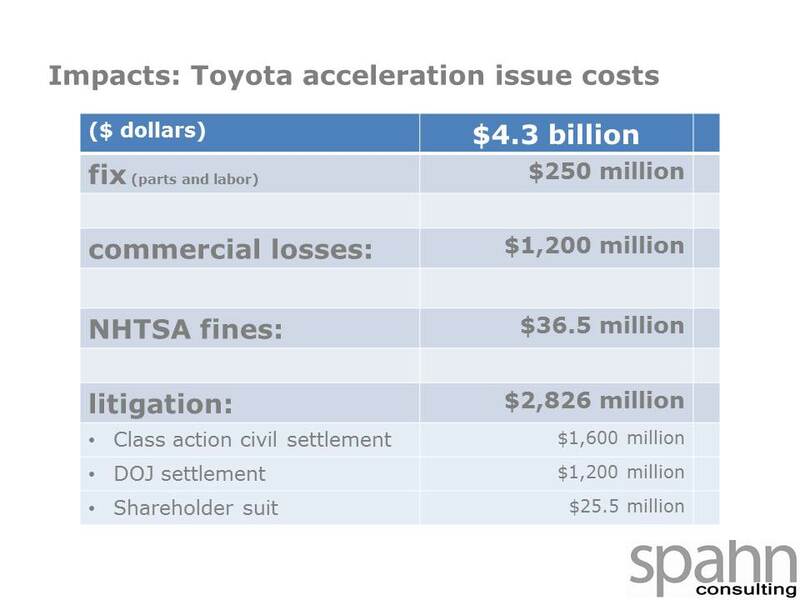 Toyota paid out $250 million alone for this item in their recent settlement. Increasing government pressure: Now that GM is no longer a “ward of the State” it will get less of a glove treatment, and in this key election year, expect more of a glove slap across the face. Already D.C> is circling the wagons calling for “reform” at NHTSA while the call for blood from GM heats up. 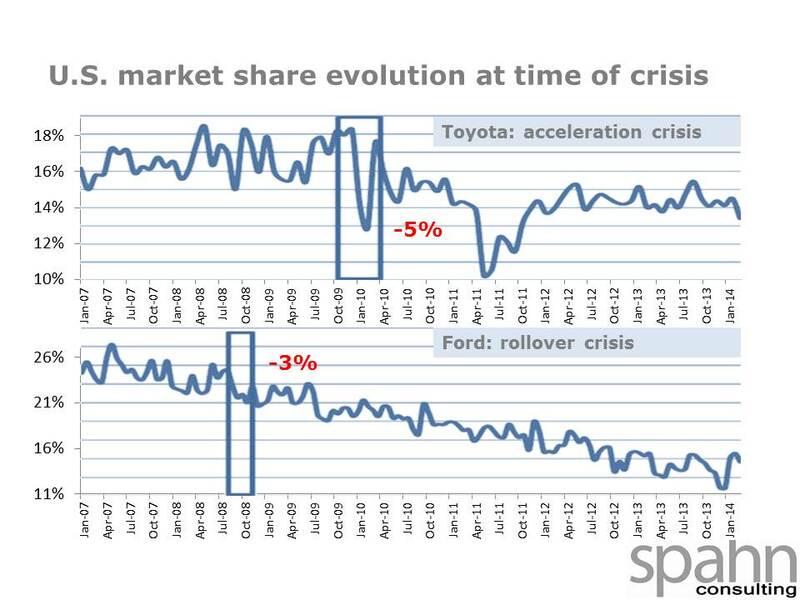 Lost shoppers: March data will tell us if GM is getting hit early, but since the news is just heating up I expect April and May to be the telling months. Not good since GM is sitting heavy with inventory. My sense is this is just heating up, not settling down.